Yearly production of Ethanol in the United States since 1980. When it comes to fuel - especially for transportation - oil is king. In 2010, the United States imported 180.8 billion gallons of crude oil which doesn't include the amount produced locally. That's a lot of oil! Although there are many competing factors which drive the demand for foreign oil, there are some which are pushing for a reduction in this dependence. While there are a number of ways to accomplish this, one obvious path lies in replacing oil as a fuel source. Since the internal combustion engine is ubiquitous in automobiles in the United States (and world-wide for that matter), it is not a simple matter to switch fuels to something like electricity (which does not use internal combustion). In practical terms, it might be advantageous to gradually reduce this oil dependence using the technology already out on the road. Ethanol is an alternative fuel which is produced from starches via yeast - a technology which has been around since our ancestors figured out how to become intoxicated. In many parts of the world the starch used comes from sugar cane while in the United States it begins as corn. Since ethanol can be burned in internal combustion engines, it can be added to existing oil-based fuel in varying quantities, thus reducing the amount (and need) for imported oil. 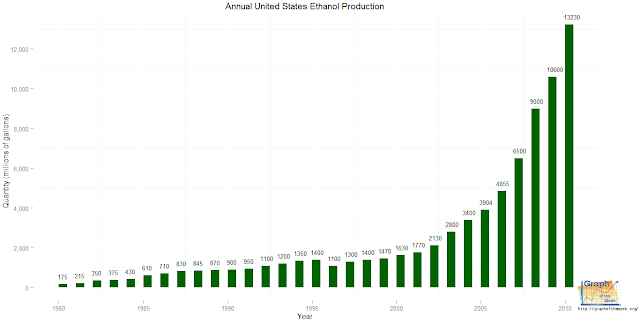 In 2010, the United States produced 13.2 billion gallons of ethanol. That sounds like a lot until you compare it with the amount of imported oil (180.8 billion gallons for the same year). In other words, for each gallon of ethanol produced locally, the U.S. imports nearly 14 gallons of crude oil. It will be quite interesting to see how ethanol shapes our future fuel consumption. 1) Will production of ethanol continue to increase exponentially? 2) By how much can we reduce our dependence on foreign oil, in practical terms? 3) How has this affected agriculture in the United States? Here is an interesting summary put together in July 2011 regarding the production of ethanol in the United States. It compares a 27% corn crop usage for 2010-11 versus a 10% corn crop usage from 2005-06 season. The acreage use was in excess of 46.5 million acres of land for the 2010 season. Also, this summary includes the production of soybeans. On page 27, it discusses the crude oil forecase and page 29 talks about the net % of farm income. A tad long, but a very good read. Thank you for the summary - do you have the link? This an article from the US Energy Information Administration. Interesting stats on this page. According to the American Public Transportation Association (APTA), public transportation in the United States saves approximately 1.4 billion gallons of gasoline and about 1.5 million tons of carbon dioxide annually. Yet only 14 million Americans use public transportation daily while 88 percent of all trips in the United States are made by car—and many of those cars carry only one person. Energy independence—According to Treehugger.com, if just one in 10 Americans used public transportation daily, U.S. reliance on foreign oil would decrease 40 percent. http://www.esa.doc.gov/Blog/2011/05/18/three-more-reasons-if-we-needed-more-break-americas-addiction-foreign-oil Another interesting article on oil/gas consumption. We, as Americans need to leave our cars parked, get physically moving, and create a healthier environment for all to live in. The EIA article is interesting - very small percentages of the whole are being made from crops. As far as taking public transportation - part of this problem stems from cities having inadequate supplies of same. That, along with suburban sprawl has really created a problem! I cannot find the original summary I took the data from but here a few more that have some interesting data. Sorry I had put the original link in here not sure what happened to it. Good articles, all. I especially like the 'fuel vs food' debate mentioned in the 3rd one. It was unknown to me that so much arable land had been 'abandoned' - not sure why or what that means, but it was interesting. I sense there is even more to this story. I believe this is the original link..
What a great article! In it, I found a graph exactly like mine (I had no idea somebody else had done something similar) on page 25.